My recent sale went very well in my opinion. I might not have sold thousands, but I definitely sold much more than I thought I would and outsold the money I spent on promotions. The sale ran 7 days for both of my books, but I only promoted Be Thou My Vision. Naturally, I sold more of those than of A Mighty Fortress, but I was expecting that. To me, the most exciting part of this promo was when both of my books were in the top 50 in Christian Westerns. 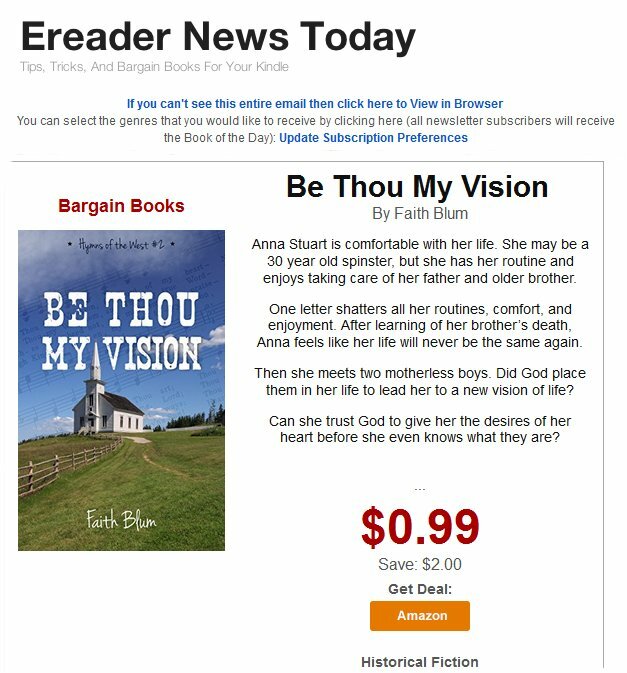 Be Thou My Vision made it to the #6 in Christian Westerns and in Westerns for a day. On December 2nd, I had a promotion on the eReader News Today website and email. The ad cost me $25, but it was well worth it. I sold 113 total books that day, 20 for AMF and 93 for BTMV for a total of over $70.00! I’ve even gotten a few post-sale sales which has been wonderful! On December 6th, I had a $5 promo on the Sweet Free Books email and website and I sold 11 books earning me about $6.00. I think that promo might have sold fewer because I had recently done a promo with the same book on their site a couple of months ago. Overall, I am very pleased with the sale. George on Be Thou My Vision: Gentleness is a missing character quality in many families and personal lives today. The author, Faith Blum, reveals how gentleness and compassion can soften even the hardest of hearts. Be Thou My Vision is a romance novel that held my attention enough to read it in a single sitting. It clearly and powerfully presents Jesus as our hope through letters, and sermons, but most of all, through the lives of it’s characters, Anna, Miles, and others. Other godly character qualities demonstrated where patience, love, and dependency on the providence of God. As I know Faith personally, I saw her own personality shine through the book. I personally recommend her book to anyone who needs encouragement and hope in their lives. Jessica on A Mighty Fortress: Well researched and an excellent plot. The author tells a story of two young men from two very different backgrounds and how a meeting, that seems like chance, changes both their lives. The story is so well told that the momentum is never lost and never seems manufactured. Completely credible description of life in the west at that time. If you love stories of the old west you will love this book. The best thing an author can hear is that people couldn’t put your book down. Well, from Saturday to Wednesday, I heard that exact phrase three times; twice about BTMV and once about AMF! Very thrilling. It makes me want to get book three out all the sooner, but I also know I can’t rush it. I still hope to have it published on February 14th, at least for the Kindle version. I think it was the promise of those words that got my dad through that execution. But I thought you should know, that someone who you have never met, but who is a Christian read your book and saw not only truth and authenticity, but God’s blessing. I know the Lord loved your book! Looking for a Christmas present for yourself? How about a signed, paperback copy of Be Thou My Vision? Click the Goodreads banner below to enter the Goodreads giveaway. It ends in a little over 5 days! Just in case I don’t post again before Christmas, have a very Merry Christmas! “Jed’s Father” by Abigail L.
The true story is wonderful. Congratulations on the sales. I enjoyed BTMV.